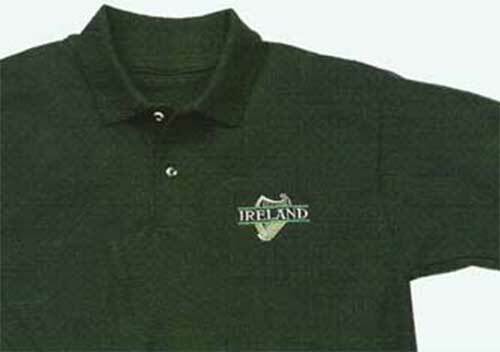 Irish polo shirt features an embroidered IRELAND that is superimposed over an Irish harp. This Irish golf shirt is available in limited sizes. This forest green Irish polo shirt features the everlasting symbol of Ireland, a harp, that is embroidered onto the left chest. This 100% cotton Irish golf shirt accented in emerald green, taupe and cream colors and includes the word Ireland embroidered in the design.